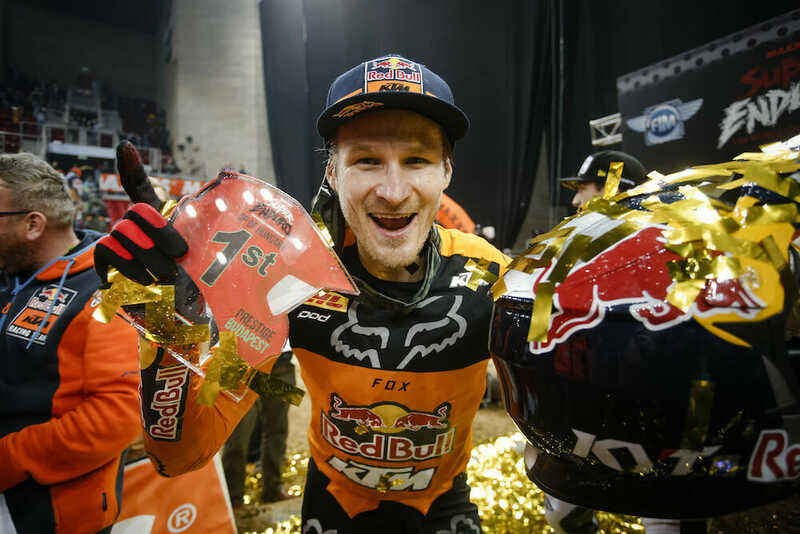 For the first time this season in the 2019 SuperEnduro World Championship, three different riders have taken top honors in the three main events, which happened in round four of the series at Papp Laszlo Budapest Arena in Budapest, Hungary, February 9. Taddy Blazusiak (Red Bull KTM), Colton Haaker (Rockstar Energy Husqvarna) and defending champ Cody Webb (Red Bull KTM) all claimed wins by the end of the night, but it was Blazusiak who claimed the overall victory. Webb started the evening off with the win in the Akrapovic Super Pole, which pays points towards the overall results, as well. Blazusiak was second. Haaker stalled his engine off the start, which prevented him for earning any points (only the top three riders are given points). In the first of the three main events, Webb shot into the early lead with Blazusiak right behind him. As the race progressed, however, Blazusiak, who was riding with a sore knee, lost sight of Webb and soon had Haaker breathing down his neck. Haaker chased Blazusiak to the checkered flag but couldn’t find a way around the rider from Poland. Webb, meanwhile, cruised to victory. In race two, with the reverse grid, Haaker found a clean route through the first turn and put himself into second place, right behind his teammate Alfredo Gomez. Webb got caught up in a first-turn pileup and came out of it all in ninth, while Blazusiak slipped passed Gomez for second. Blazusiak made up some ground on the leader, Haaker, but ran out of time, as Haaker went on to win the race ahead of Blazusiak. Webb fought his way up through the pack and finished third. In the final race, Blazusiak nailed the holeshot just ahead of Haaker and Webb for what promised to be a thrilling end to the evening. And it was. At one point, Webb tried getting around Haaker, just as Haaker was trying to get around Blazusiak for the lead, but positions somehow stayed the same. Eventually, Webb bobbled in the rock section, allowing Blazusiak and Haaker to get away. Haaker then tried every trick in the book to get around the veteran Blazusiak to no avail, with Blazusiak (2-2-1) holding on for the race win and the overall victory. Webb earned second overall via his 1-3-3 tally, and Haaker ended up third with his 3-1-2 results. The three extra points Webb earned by winning the Super Pole ended up putting him one point ahead of Haaker on the night. Despite his third place, Haaker is still in control of the championship. With one round left to be run in Bilbao, Spain, April 6, Haaker leads Webb by 12 points. Blazusiak is third, 15 points down on Webb. “It was another very intense event,” Webb said. “I had so much pleasure during the first final. I knew I had to take a good start to win it. In the other heats, it was more difficult especially in the second one when I got stuck and I had to restart nearly last; I still finished on the podium. “It was a crazy night,” Haaker said. “I’m very pleased with my performance. In the first final, I was coming back from behind. I did a good recovery, but I could not pass Taddy. The second heat was perfect. In the last one, we all fought really well. I nearly passed Taddy three times, but, in the end, I stayed behind him.